Every good superhero movie has the iconic car-chase sequence—the whizzing lights, the dim glow of nightlife, the cutthroat vigilante. Marvel’s Black Panther, the highest grossing solo superhero movie of all time, did not disappoint. After he is crowned king of Wakanda, our protagonist T’Challa (Chadwick Boseman), plans to foil a vibranium deal headed by villain Ulysses Klaue, a South African arms smuggler. With ex-girlfriend Nakia and head bodyguard Okoye, the sharply dressed trio fly into Busan, the second-largest city of South Korea. After nonchalantly walking into a seemingly normal night market of the Busan streets, Nakia (Lupita Nyong’o) approaches a Korean vendor and gains access to a top-secret gambling joint. There, the three Wakandans run into the maniacal Klaue and the car chase ensues. And after watching the car-chase, I was feverish. I knew this movie was going to be good but I’ll be honest: I hadn’t been this riled up over a single car-chase in a while. What made this single sequence stick with me even after I left the theater? Was it the visually stunning, neon glow of Korean characters reflected off the windows of high-tech, Wakandan vehicles? Chadwick Boseman’s phenomenal physicality and mesmerizing charisma? Or Lupita Nyong’o and Danai Gurira’s powerful female dynamic? I actually happened to be in South Korea for the PyeongChang Winter Olympics when I watched Black Panther, as I couldn’t wait another week to catch it in an American cinema. After some contemplation, I realized that though there are several aspects of the car-chase that were exceptional, the key factor that made this sequence so special to me was the spectating itself—I was surrounded by South Koreans, the largest international consumer of Marvel movies. Though a nation the size of the state of Virginia, South Korea consumes Marvel entertainment at a highly disproportionate rate; at every Marvel release of the past decade, this country has consistently topped the global box office. In Black Panther’s case, the film earned $25.3 million during its opening week, which is more than every other country outside of the United States of America. This phenomenon is exclusive to Marvel. Any other franchise of the Disney conglomerate, such as Star Wars or Pixar, garners audiences of normal capacity. For some unknown reason, it is Marvel that soars above all competition. Granted, the moment “BUSAN, SOUTH KOREA” appeared on screen, the audience shrieked in delight. Lupita Nyong’o delivery of flawless Korean conversation with the Busan street vendors garnered a following hoot from my fellow spectators. Though Black Panther takes place in South Korea for only around twenty minutes, getting to see this groundbreaking celebration of Black identity also immerse facets of South Korean culture into its narrative was electrifying—seeing South Koreans overjoyed at their shoutout embedded in this Black superhero film made me realize just how influential these franchises are. International audiences are encouraged to partake in the celebration of empowered people of color, which is exactly why representation in these movies matter. All things considered, the decision to set this particular car-chase in Asia actually seems intentional. After following most of the cast on Instagram, I scrutinized each actor and actress’ respective feeds to find their promotional photos. 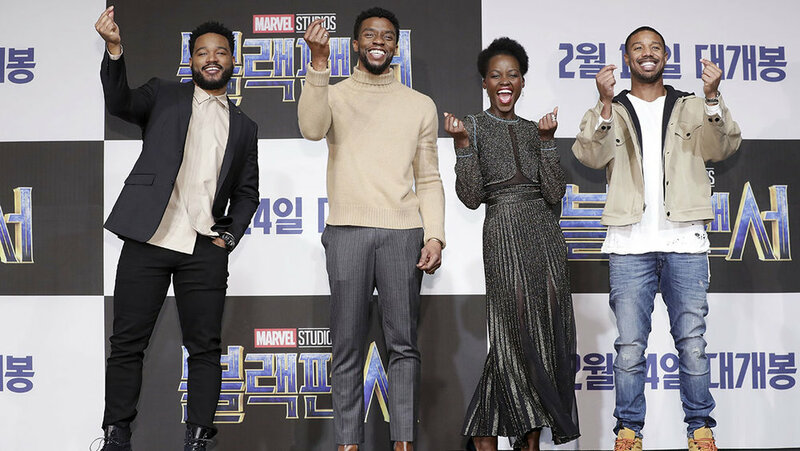 And on each of their accounts, there are group photos of Chadwick Boseman, Michael B. Jordan, Lupita Nyong’o, Danai Gurira, and Daniel Kaluuya placing their thumbs against their index fingers to form a mini heart, an extremely popular photographic pose used by young Koreans. They were marketing Black Panther in Korea, their very first stop of their promotional tour. Even the other actors of the Marvel franchise acknowledge Marvel’s extreme popularity in this small, Asian country. Every time Robert Downey Jr. begins to doubt his relevance, he claims that a promotional visit to South Korea is enough to remind him of his inherent fame. Marvel is catering to a country that has undying love for their art. Ultimately, I believe that the path to successfully telling stories of minority identity starts with connecting to people who watch America’s cultural and political complexity from such a distant lens. The zealous audience surrounding me in South Korea made Black Panther a memorable, cinematic experience—watching an American blockbuster in a foreign country really helped me put things into perspective, as beforehand I was painfully unaware of the intensity of our cultural influence. Like antagonist Erik Killmonger, I am a California native very much aware of my cultural origins. As a Korean-American, I cannot fully express how satisfying it was to see the different facets of my identity displayed on the big screen.